John and Jane Stewart are my Great-Great-Grandparents, they are some of my closest and most enigmatic GG-grandparents. Close, in as much as my Grandma was a Stewart, and I carry the name Stewart as one of my middle names. Enigmatic, as their identity seems to constantly shift. When I was young their identity was clear. They were Stewarts, clearly Scottish and possibly, like the tartan of the same name, Royal. Later, when I first had access to the on-line British censuses, I was rather shocked to discover they came from Ireland. The reality, like the history of Ulster itself, is more complicated. But before I go further I need to make one thing clear. I have no pro-Irish or pro-Loyalist identity. In writing this I’m hoping not to offend anybody, but merely tell a family history. Ulster is somehow paying for the sins of the past, caught in the complicated relationship between Gt. Britain and Ireland. It can’t be solved by trying to right the wrongs of the past, but only trying to find a better future. I’m using the term Ulster as it fits in with the ethnic term Ulster-Scots, (the same as the more north-American term Scots-Irish), which, as far as I can see is how my GG-Grandparents would have described themselves. I’m also writing this article to help those, like me, who struggle trying to understand the processes and terminology that you need to understand to trace Irish ancestors. For some people it will be a whole new world, for others I may well just be stating the obvious – probably rather badly. To understand John and Jane it is perhaps best to start with one of the key documents identifying the family. The 1871 Census. The first English census record I can find for the family. This is an interesting record. For a start, although the parents are quite old (John was 60, Jane 54) they still have many of their children living with them. In fact the only known child not living with them is their daughter Eliza, who as you may have spotted was now married and living next door. I’ve already written about Eliza. She married George French on the 2nd August 1869 in Shildon. I suspect that the whole Stewart family moved together from Ireland to England before Eliza got married, so dating their move to England as before then, but after the birth of robert Stewart around 1858-59. As you can see from the census both John and Jane are recorded as coming from Tyrone in Irland (sic), whilst the children are from derry (sic). As I understand it, the enumerator was supposed to enter the country of birth for anyone born outside of Gt. Britain. I assume that in this case he/she recorded the country and county. For many years that was the best I knew of the family, they were my proverbial genealogical “Brick Wall”. For Jane I had no maiden name, so she had to suffer the indignity of being recorded in my family tree as Jane Unknown. This all changed, by luck, this year. 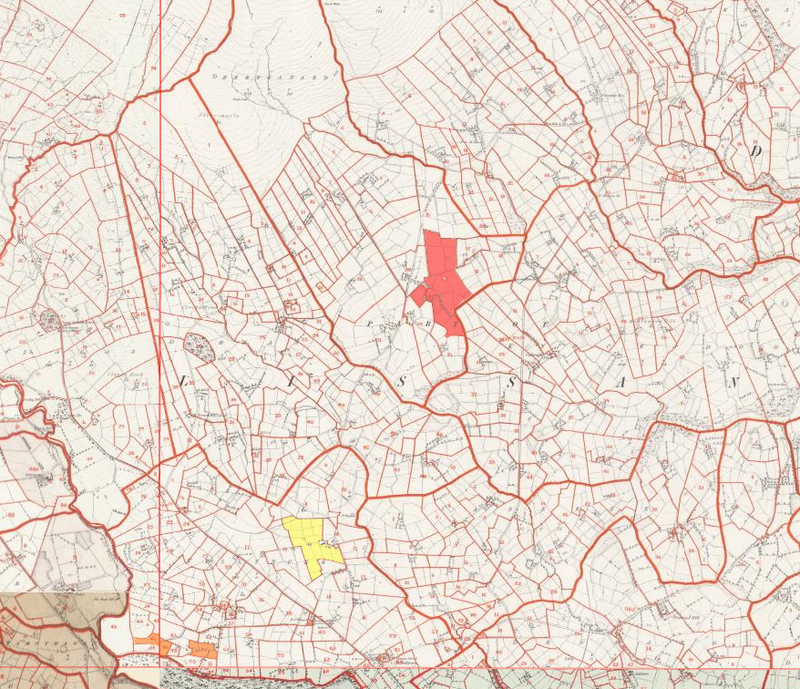 They were married in Lissan, a small village based on the border between the old Co. Tyrone and Co. Derry (see map below, Lissan is on the yellow/green border). John Stewart’s age was 37, which put his birth around 1811, as predicted by the 1871 census. The parents of John and Jane were recorded as Charles Stewart and Alexander Bell. Interestingly John and Jane named 2 of their 4 sons Charles and Alexander. A rather nice map of Ireland from 1844. Lissan straddles the Co. Derry/Co. Tyrone border. Naively I called the GRONI and asked for a record. They told me they didn’t have it and referred me to the PRONI. I emailed the PRONI and 2 weeks later they sent me back to the GRONI. 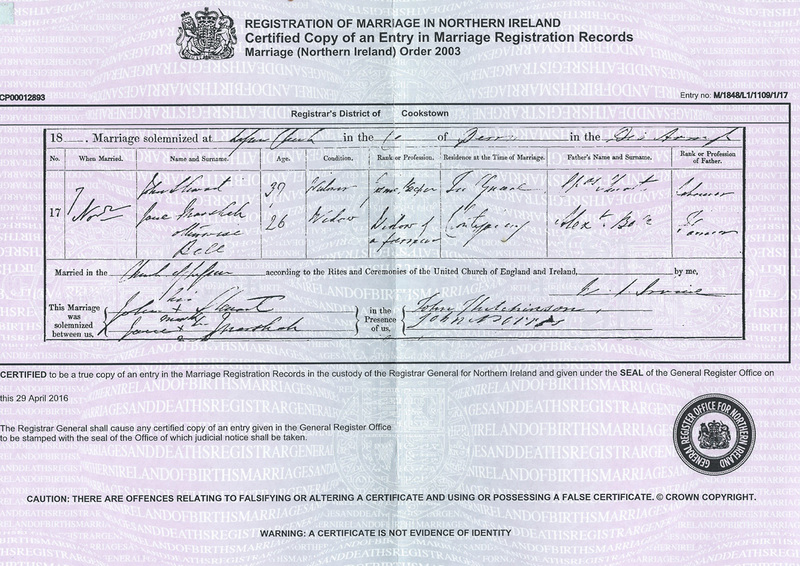 I then battled the rather rubbish GRONI website until I found the marriage record and could order it (I couldn’t find the marriage record until I removed the Magherafelt district from the search field). Both John and Jane are in a second marriage after the death of an earlier spouse. It could be just co-incidental but they married in the middle of the Great Famine in Ireland. Whilst Northern Ireland did not suffer as much as the south and west of Ireland, it could well be that the death of previous spouses was due to the famine. It also leaves open a question of children from the earlier marriages ? John was a Gamekeeper. I find this unusual in a land of small-holders. Perhaps he was employed by the Staples Family that owned the nearby Lissan House. The Parish of Lissan lies at the foot of the Sperrin Mountains, so would be an good base for someone looking after grouse in the Sperrins. The “Residence” information for both John and Jane is a little hard to read, my best guesses are the townlands of Derryganard (Doire gCeann Ard) and Cluntyganny (Cluainte Geanaidh). These townlands are both in the Parish of Lissan. Interestingly Derryganard is in Co. Derry, whilst Cluntyganny is in Co. Tyrone. We finally have a surname for Jane. She is Jane Bell, the daughter of Alexander Bell, but was previously married to a farmer called Marshall. Having found the marriage record I was curious to see if I could find any other references to John Stewart and his family, which means I need to touch on two very important concepts for genealogists researching Irish ancestors; namely Townlands and the Griffith Valuations. If you’re familiar with both of these ideas, fell free to skip forward, whilst the rest of us hopefully learn a bit. As wikipedia put is “A townland (Irish: baile fearainn) is a small geographical division of land used in Ireland. The townland system is of Gaelic origin”. It’s smaller than a Parish and normally sub-divided into plots for the Griffith Valuations. To give you some idea of the scale. Lissan Parish has 40 townlands. Cluntyganny townland was 264 acres, whilst Derryganard was 828 acres. In the absence of pre-1901 census records these are a key primary source for anyone researching their Irish ancestors. The downside is that the Griffith Valuation was a valuation book. It only describes who owned something and who leased it. The only names recorded are the head of the household. The Griffith Valuations are available on a number of websites, however I’ve found the best free source is the National Archives of Ireland site. This site includes the maps associated with Griffith Valuations, so you can see the exact land that each person leased. John is recorded twice, first leasing a small “House and garden” to Alice M’Keever and secondly leasing a”House,offices,and land“. Clearly this second record is a relatively large area, over 32 acres. In addition there is a John Stewart sharing a plot of 452 acres in Derryganard with 17 other tenants. The land looks to be rather rough land on the edge of the Sperrin Mountains, so I’m guessing that this would be common grazing land. This is all exciting until I checked other Griffith Valuation records for the parish of Lissan. These show two other John Stewarts leasing property in the nearby townland of Tullynure. The first Tullynure reference is for “House,office and land“, in this case 16 acres (as shown below). Notice that the landlord is a Staples, the family who owned nearby Lissan House. The second Tullynure reference is for a John Stewart leasing a “House and Land” in 2 smaller plots directly from Sir Thomas Staples, 9th Baronet of Lissan. This would be an appropriate location for a Gamekeeper to live. As a result of this information there could be anywhere between one and three John Stewarts living in Lissan, one of who could, but need not be, my ancestor. For reference I’ve mapped all three plots (see below). The red plot is in Derryganard townland. The two orange plots are the ones leased directly from Sir Thomas Staples. Directly below the orange plot, and just off the map, is Lissan demesne. These are the lands owned and used directly by the Staples family, including the parklands around Lissan House. This is, sadly, all we can find out about John and Jane. It appears that the Lissan parish registers were lost, along with many other records when the Public Records Office of Ireland was destroyed in 1922. Before we leave John and Jane we need to look at one thing that wasn’t lost, their DNA. I’m lucky to have a Stewart cousin who has been heavily involved with the Stewart yDNA project. The yDNA is the DNA that determines that a child is male and is passed down, normally totally intact, from father to son. Mutations in the yDNA can be used to determine common ancestors among a group of testers. In this case my cousin has mutations that confirm his link with many other Stewarts alive today. More importantly he has a specific mutation, ZZ52, which has recently been tested and identifies him as a direct descendant of King Robert III of Scotland. I wonder what my ancestor, John Stewart would make of this ? This entry was posted in Genealogy, MyFamily and tagged ancestry.com, Genealogy, Genetic Genealogy, King Richard III of Scotland, Lissan, Royal Stewart, Stewart. Bookmark the permalink. This was drawn to my attention because my mother was a Stewart until she married my father Jim Weir. The Weirs lived in Derrygenard, the same townland shown for John Stewart and “our” Stewarts lived in Tullycoll (sometimes Tullycall). I cannot immediately see a link to John and Jane but living so close there may be a link if we can go back a generation or two. Many thanks for your comments. I would love to find connections to relatives in Ulster and your ancestors must, somehow, be related to mine. Yesterday I was taking advantage of the free access offer from FindMyPast (http://www.findmypast.co.uk/explore-your-irish-ancestry/) to see if I could find more details on the Stewart and Bell families. Sadly they are currently lost in the fog of the 19th century records. I don’t know if you have done any DNA testing, but there are a couple of ways that we might show that we are connected. An autosomal test, for example the DNA test from ancestry.co.uk, might show a link. Both myself and a Stewart cousin have autosomal tests online at Ancestry and familytreeDNA.com. An alternative, if there are any male Stewarts in your family, would be a yDNA test which should be a close match to my Stewart cousin. Anyway please feel free to contact me offline via hungrybuffalo@gmail.com. When you posted your comment you registered your email address. When you get replies to your comment they are posted here, and you receive a copy of the reply as an email to the address you registered. This reply is sent by wordpress.com, who provide the platform for my blog. My reply included an email address if you wanted to contact me, as some people don’t like published family history details on a website and prefer to communicate one-to-one. As you may have seen “hungrybuffalo” is the pen-name I use on this site. I too have the ZZ52 marker and my roots are in Kintyre, Scotland, around 1680. John and Charles are Stewart names that feature prominently in my tree. I believe my line from Robert III is down thru. the Ardgowan/Blackhall route. So far there are 16 kit numbers which have ZZ52 (FTDNA). 7 of these can be traced back to High Park, Kintyre, and 1 to Ardgowan. This leaves the remaining 8 as unknown source. Many of them are in Ireland.We still have much research to do. Hi, Many thanks for the update on ZZ52, I’m excited to see how this research develops, especially for the Ulster Stewarts. Hi Alysia I’m not sure I’m going to be able to help much, but let me give you a couple of suggestions. Firstly have you tried DNA testing ? If you have a male Stewart left in your family line he could take a yDNA test at FamilyTreeDNA and join a Stewart/Stuart DNA project (for example: https://www.familytreedna.com/groups/stewart/about). This may help you connect back to a branch of the Stewart family. Even without a male Stewart to test you could do an autosomal DNA test, for example like the one at ancestry.com. This might connect you to Stewart relatives who may be able to help you with your research. Secondly, even without any direct DNA evidence there’s a fair chance you are related to Stewart royalty, at least according to this article: http://www.telegraph.co.uk/news/uknews/scotland/10608807/Half-of-all-the-men-in-Britain-with-surname-Stewart-descended-from-royalty.html. Caveat Emptor – I can’t vouch for the quality of research done on this. BTW. You didn’t mention where you think your John and Jane Stewart came from. Do you have any idea of their birthplaces. The dates you have don’t seen to fit with the ones I’ve researched here. Hi. The same John and Jane Stewart were my great-great-great-great grandparents. I am descended from their son Robert and Robert’s son Alexander. It’s unlikely that I have much information about John and Jane that you do not have already but I’ve got records of Jane’s mother, a little information on John and Jane’s children, a photo of Robert and his wife Maria, Robert’s death certificate, and details of John and Jane’s grandson Alexander’s descendants up to the present if any of this is of interest to you. Forgot to mention, I also have photos of two young women labelled just ‘Mary’ and ‘Sally’ which came with the photo of Robert and Maria. I guess they are likely to be Robert’s sisters or daughters, do you have any thoughts on this? I saw your post suggesting that John and Jane may have had a daughter called Sally and your note that Robert mentioned 3 sisters who died of TB – could Mary possibly be the third sister? MANY thanks for contacting me – yes, I’m interested in all of the above. I’ll drop you an email. If nothing has arrived in 24 hours please let me know.